If you are a retailer interested in carrying our popular Cyndibands elastic hair ties and headbands, please complete the application process. Please email us a photo of your store. We can recommend an opening order assortment that has proven retail success. We provide marketing materials and complimentary CB containers to display in your store. 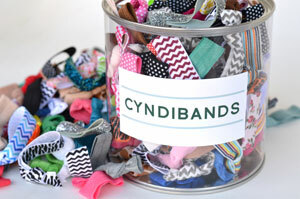 Our retailers have had great success when displaying Cyndibands right at their checkout counter.